Meet ostriches, zebras, lions and other exotic animals in the comfort of your car an unusual experience that will please the whole family ! Located in the Yvelines and only about forty kilometres from Paris, the Thoiry Zoological Park is the *largest African reserve in the entire Paris Region. On a vast estate of 150 hectares, visitors can enjoy a safari circuit by car but can also discover many areas on foot. Birds, reptiles and large mammals live together in harmony and will amaze all audiences. The visit can end pleasantly with a stroll through the green labyrinth and the vast theme gardens of the park, filled with familiar or more exotic scents. Opening of the château from Monday to Saturday from 1.30pm to 6pm, Sunday from 11am to 12.30pm then 1.30pm to 6pm. Opening of the château every day from 12.30pm to 4.30pm. 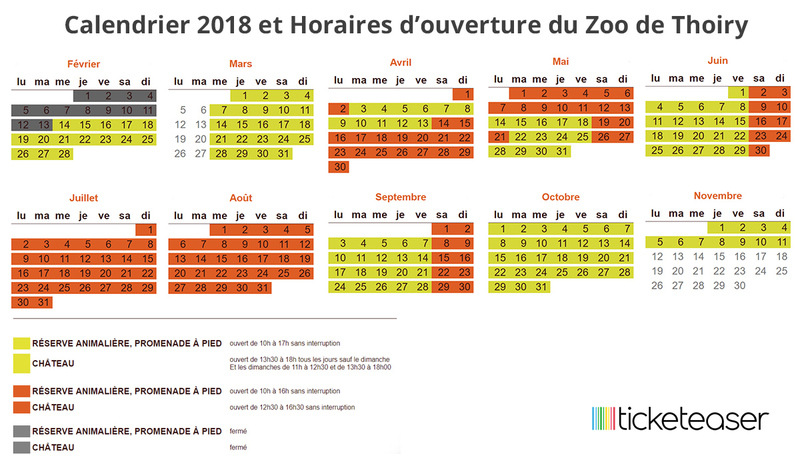 See the detailed calendar of Thoiry Zoo opening times. The safari, access to the zoo, the playground and the château are included in the entrance fee.. Animal reserve : You have access to an 8km safari in the middle of wild animals in freedom, on board your own vehicle. Elephants, rhinos, zebras, bison, bears or warthogs, you will discover more than 30 species of African herbivores. Château de Thoiry : Magnificent Renaissance castle with a magnificent botanical garden. Free visit of the ground floor rooms and the archives room. From Paris : Take the Transilien line N (Paris Gare Montparnasse <=> Dreux) to the station of Montfort-l'Amaury - Méré then take the shuttle (zebra bus) to the park. The shuttle runs every Wednesday and Saturday of the school holidays (from February to October and during the school summer holidays ), from Montfort-l'Amaury- railway station Méré at 9h36 for a return at 17h25. Accès : Take the A13 motorway to Porte d'Auteuil. At the junction, take the A12 motorway then the N12 direction Dreux. Take exit Thoiry, follow D76 then D11 direction Thoiry. With the Tyrolean flight you can fly like a real bird and fly over the lions' territory and the African plain. The zip line is 500 metres long and reaches a height of 20 metres. From 8 years old, single price 6€ on site. Access a guided tour in the middle of wild animals with an animal caretaker, aboard a safari truck. (Price: 6€ on site).